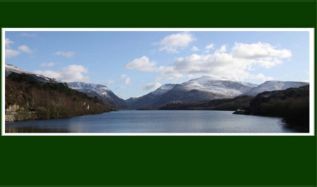 Welcome to the Hafod Rhug Uchaf website. We are situated in beautiful Snowdonia in the village of Waunfawr which has a shop and a local pub serving real ale which is brewed at the premises, as well as home cooked meals. They also have a family room. You will find all you need for a wonderful holiday with beaches, mountains, places of interest and plenty of activities for every age. Hafod Rhug Uchaf is a working sheep farm with glorious views down to the sea. After driving down our private quiet lane you will come to the traditional stone built cottage next to the main farmhouse where a warm Welsh welcome awaits you.
" One of the nicest cottage we have stayed in and all the extra touches were most appreciated. We love the setting"
Hafod Rhug Uchaf is a traditional stone built cottage that is located next to the main farm house where the owners live. 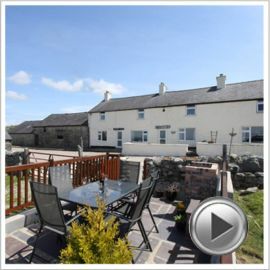 From the property there are views over Caernarfon Bay towards Llanddwyn beach with it's lighthouse and across Anglesey, and on a clear autumn day you may be able to see the Wicklow mountains of Ireland. Hafod Rhug Uchaf has been carefully renovated to retain the original charm of the property. There are beamed ceilings, and open fireplace for you to enjoy. However at Hafod Rhug Uchaf you will also find modern appliances to make your stay as comfortable as possible and making this property a combination of the best of both worlds!